It's refreshing to see a larger city like Asheville, NC so engrossed in the slow-food movement. I mean, it is what many foward-thinking food lovers are concerned with these days or so it seems. People who are consciously aware of where their food comes from want to know that ingredients have been sustainably obtained from local resources in a manner that will support the community as a whole. This farm-to-table mentality is regarded as a new trend, but what the heck do you think people did back in the day when there was no such thing as processed foods?! Really. You grew your own food and made meals based on what you had. Nothing more, nothing less. So, to see so many restaurants that have relationships with local farmers warms my heart like there's no tomorrow. That's the way it should be if you ask me. 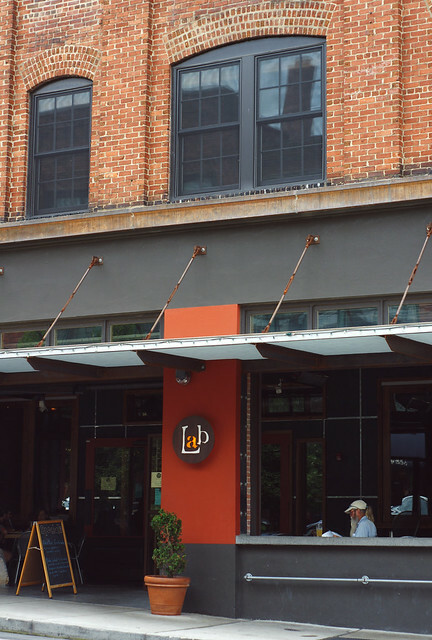 Downtown Asheville, NC is home to a large number of independently owned and operated dining establishments that are embracing this way of doing business. The residents and visitors who insist on consuming food fresh from local farmers are helping to support this commitment in a big way. The strong grassroots support is very apparent in this radical little city. That's why I love Asheville! The last time I took a trip down to Asheville, NC was the previous summer with Cody and my friend Christie. We were, literally, only there for a 24-hour period, so we didn't have as much time to explore the downtown area as we would have liked. Really, though, I just wanted to eat at more restaurants! Haha Cody and I talk about taking time to go down there more often, but it just doesn't happen. We let an entire year pass by before we made the short 2-hour drive to do some more exploring...I mean, eating. It's widely known that I have a slight obsession with food these days, so our main focus for this recent trip was to, quite simply, eat. Armed with a few suggestions from people who follow WW on Facebook, we set out to consume as much as we could. Here are some of the notable restaurants with a focus on locally obtained ingredients that we ate at while in town for 3 days. All of these are in the downtown district, and were within walking distance of where we were staying. 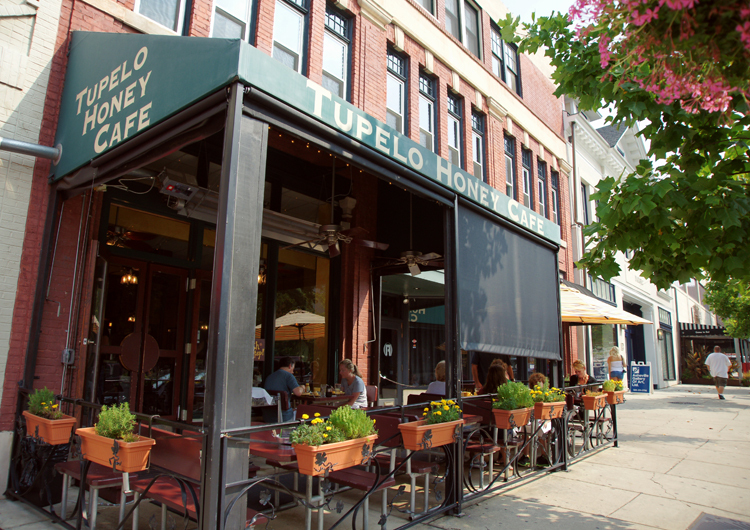 For the Best Homestyle Breakfast: Tupelo Honey Cafe — I was dying to eat at this popular eatery when we were in town the last time, but we just couldn't find the time. This time, I made sure that it was the first restaurant we ate at so as not to make the same mistake twice. I've heard that wait times can be extensive for this place, but we were seated right away. When you go mid-week for an early breakfast, I suppose that you can beat the crowds. They quickly won me over after bringing us a complimentary biscuit that I then drizzled with honey. It was fabulous! I ordered the Fried Egg B.L.T. with a side of goat cheese grits. 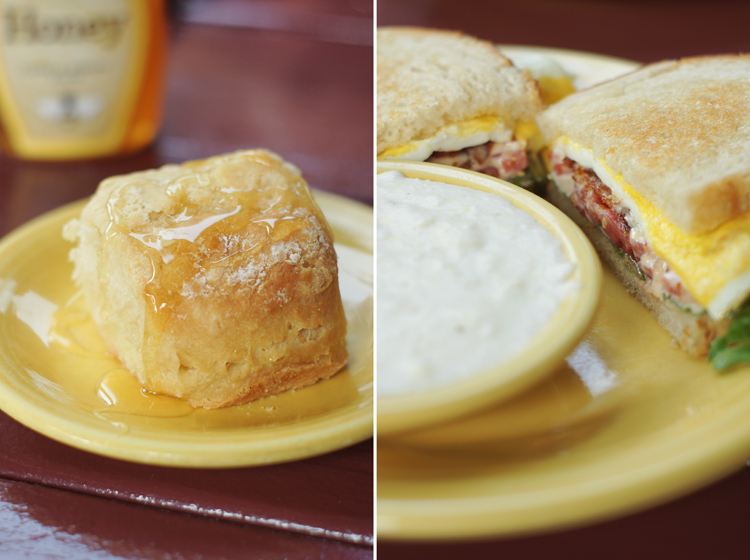 The sandwich was hearty, and the grits were excellent. Someone on FB warned that I'd be stuffed all day long if we ate here. Boy, were they right! The meals we both had were very filling. Our next meal wasn't until dinnertime later that day. 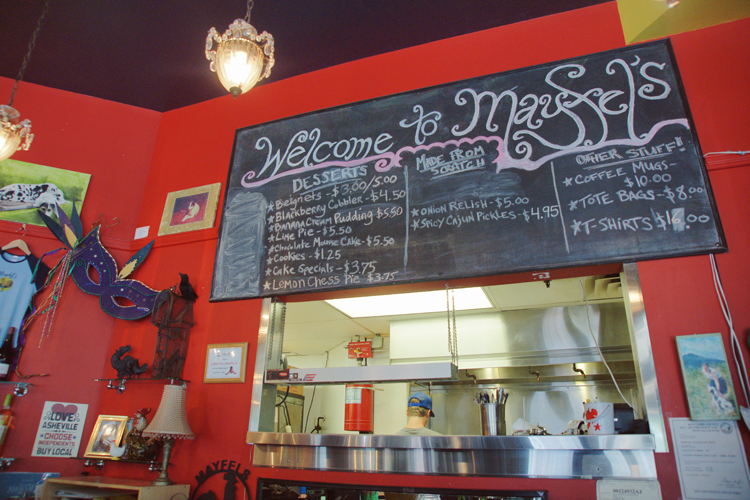 For the Best Brunch: Mayfel's — I was completely smitten by the eclectic décor in this restaurant. It reminded me of New Orleans with the brightly colored orange walls and sparkly chandeliers. Since this was the last restaurant that we'd be eating at before leaving Asheville, Cody and I kinda went all-out when ordering our meal. We started with a ½ order of Beignets and a helping of Fried Green Tomatoes. I know, FGT's aren't very breakfast-y, but we got some anyway! We gobbled down the plate in no time flat. They were unlike any other FGT's I'd ever had, topped with roasted red pepper aioli, goat cheese, & Mayfel's own sweet onion relish. It was an interesting and tasty twist on the classic recipe to say the least. We didn't stop there, though. Cody and I both got hamburgers to boot. Even though it was closer to breakfast time, I was craving something more substantial. My burger of choice was the Lumberjack, which had bacon and a fried egg on top among other things! So, it was sort of breakfast-y. I couldn't get over how delicious the bacon was. However, the entire burger was superb. I really enjoyed it. Would you believe that I finished it all?!? I told ya, this girl can eat :D.
For the Best Pub Grub: The L.A.B. — The Lexington Avenue Brewery offers gastro pub fare and house-brewed beers. We popped in on our first evening while walking around downtown because it was suggested to us by a friend. We settled in on the large patio along the busy sidewalk, which ended up being a great place for people watching. I tried their Raspberry Wheat beer, and Cody had the American Nitro Stout, neither of us had any complaints about the brews. To munch on, we ordered the Venison Nachos because I saw someone near by with a plate that made me drool. They came covered in black beans, chimichurri-spiced venison, LAB's special nacho cheese, and chipotle sour cream. Talk about scrumptious, they were so yummy. I loved the nacho cheese and LAB's homemade hot sauce. Cody and I used almost half the bottle dousing our chips! Sadly, they didn't have any additional bottles for sale at the time. For the Best Tapas Bar: Cúrate — Practically right around the corner from where we stayed sat this hot spot that we walked by nearly everyday. On our last evening in Asheville, we finally made our way over there with a friend to test some of their authentic Spanish tapas. I loved how they had an open kitchen right in the middle of the restaurant. Next time, I want to sit at the bar where I can see all the action! Initially, we were almost scared off by the menu the day before because the titles are in Spanish while the descriptions are in English. It was slightly confusing at first, but our friendly waiter helped steer us in the right direction! It was tough making those decisions with so many options to choose from. Due to the small portions that are typical with tapas, our waiter proposed that we each get three items. However, the prices drove us to select only three to share between the two of us. We treated ourselves to the 'jamon iberico de bellota fermin', which was cured ham from the famous black-footed iberico pigs of Spain. The slivers of ham were very flavorful. I loved the hint of saltiness. 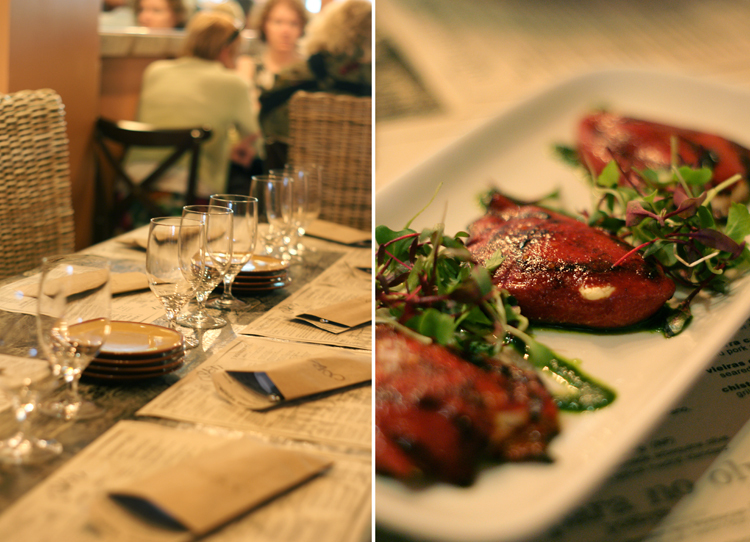 Our favorites were the 'pimientos de piquillo con queso de cabra', piquillo peppers stuffed with cana de cabra cheese. The peppers were beautifully roasted and oozing cheese, a piquant combination that we both wanted more of! Which of these restaurants sounds good to you? 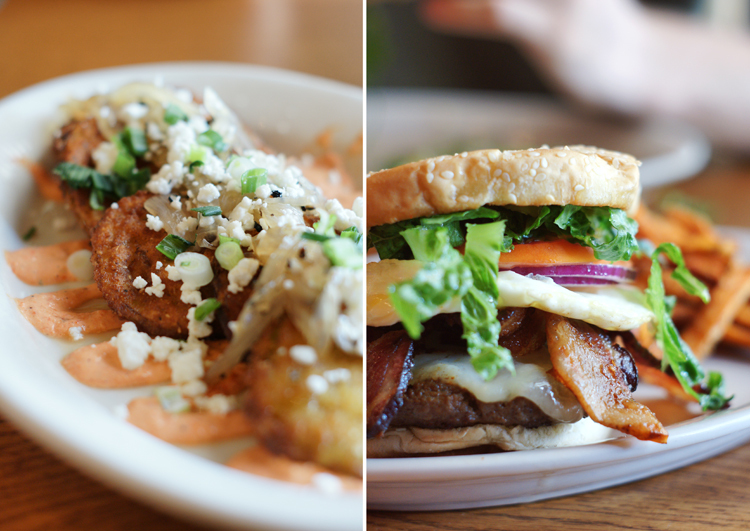 In the next post about our trip to Asheville, NC, I'll share the places we popped into when in-between meals! Could not agree with you more about Tupelo Honey. 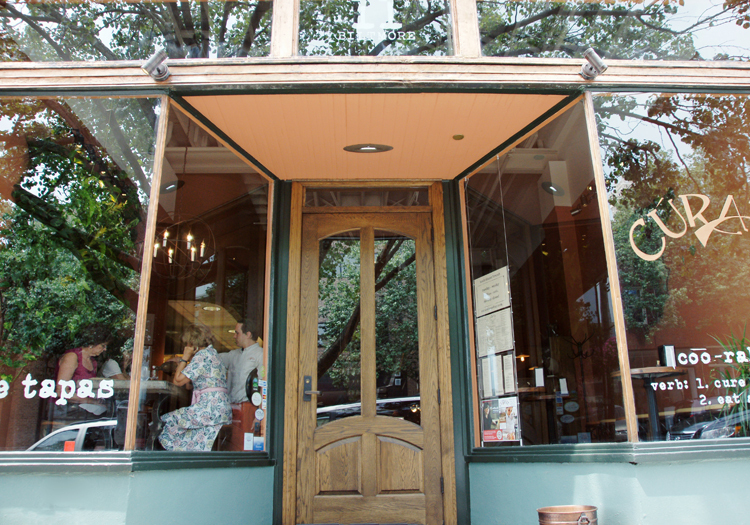 It is hands-down my fave place to eat in Asheville. In fact, I have wanted to try Mayfel's, but since it is right next door to Tupelo, I just can't bring myself to try something new! Will have to check out your other suggestions! Looking forward to your next post...will be interested to see if my favorite spots were the ones you picked! Hey, App Gal! I'm so glad we finally ate at Tupelo Honey. It was awesome! We did eat at Early Girl and enjoyed it, I just didn't want to make the post too long :D The French Broad Chocolate Lounge was a favorite of mine, too. You'll definitely see a blurb about them! I guess it's not downtown but I like Westville Pub. Surprisingly good food. @Joan: One of my friends was just talking about Westville Pub yesterday. She was saying that the next time were in town, we should explore West Asheville some. Love Asheville. One of our favorites is just across the street from Tupelo. It's the Jerusalem Garden Cafe. It's like stepping into "Aladdin."